From left to right: SJ. Hyun– Business Unit Director, Leszek Kuczyński- President of Board of Directors ETIS Ltd, Young Ik Lee - President LG Electronics Polska Ltd., Adam Kalata- Vice-president of Board of Directors ETIS Ltd.
LG Electronics, the South Korea's second-largest electronics maker and the world’s third-largest appliance maker, opened the second LG Air Conditioning Academy in Wroclaw, Poland.on Nov. 26, 2010. This event was marked by the presence of Lee Young-Ik, president LG Electronics Polska Ltd. and S J Hyun, its Business Unit Director. ETIS Ltd. was a designer and general constructor of this academy. professional trainings will be conducted to increase the staff’s qualifications and to broaden their knowledge on air conditioners, their functioning and installation. 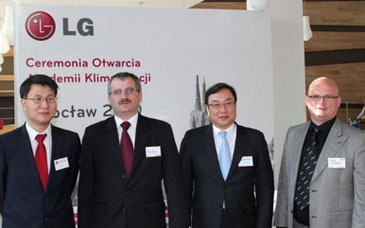 Presently, other LG academies in Poland are designed in Cracow, Gdansk and Poznan.